In September 2015, we first-ever learned what is the 100% workload of our system. 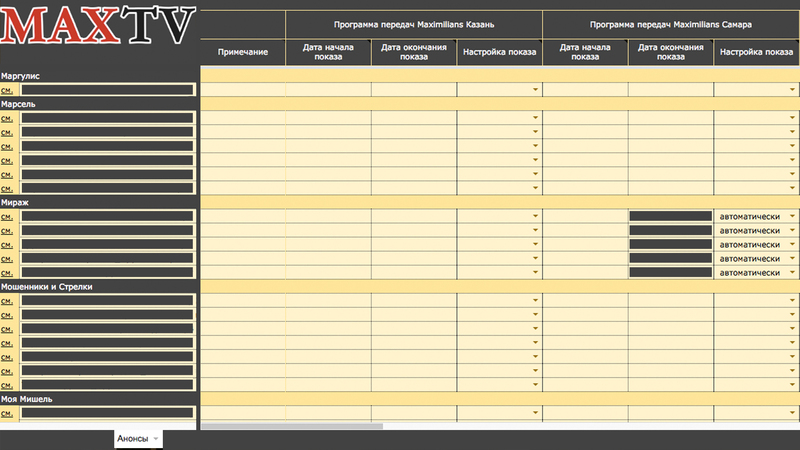 We started working with a chain of restaurants Maximilians in 8 cities of Russia. The creation of Max TV is a demonstrating story on how television can be a part of the restaurant concept and one of the ways to increase sales. Many people say that the concept in a restaurant is the most important thing. For example, colleagues from RestConsult directly write in their article on vc.ru about the work of some restaurateurs on the principle of "Opened. Worked. Closed". We agree with the following: the concept is the most important thing. One of the most popular ideas - beer shops with the livestream of football matches. The chain of restaurants Maximilians moved on. They were the first who created the format of a beer restaurant with a real concert stage. There are the performances of famous bands: Leningrad, Kuzmin, Smyslovye Gallyutsinatsii, Yolka, Gorod 312 and many others. 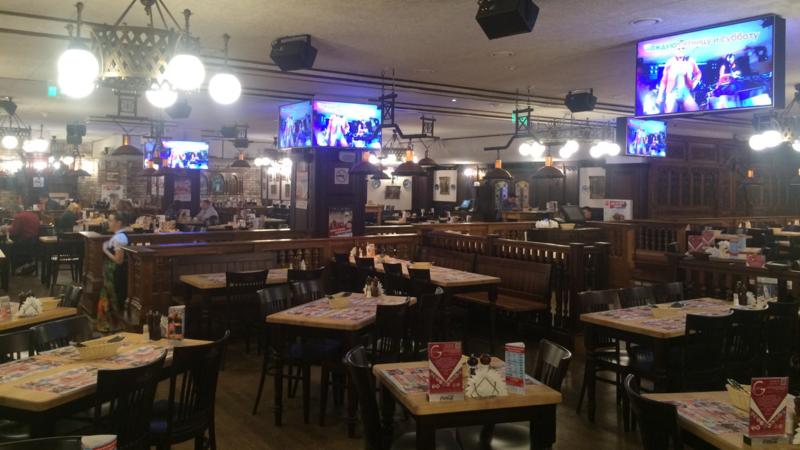 The area of each restaurant allows to accommodate from 700 to 1400 seats, so in each corner there are screens, so that guests can watch the performance on stage. Insofar as the businesses earn by concerts, the issue of their promotion and ticket sales is one of the main questions for the management team. Previously, in every restaurant there was a media player, videos were created in one place, and then transfered to art directors in all 8 restaurants through Yandex.Disk system. And at the time of transfer there were a lot of problems: ranging from "human factor" when people just forgot to download/upload something to more complex technical problems when it was impossible to play some specific formats. Those who produced videos could not foresee everything, those who locally uploaded the videos knew nothing about it. 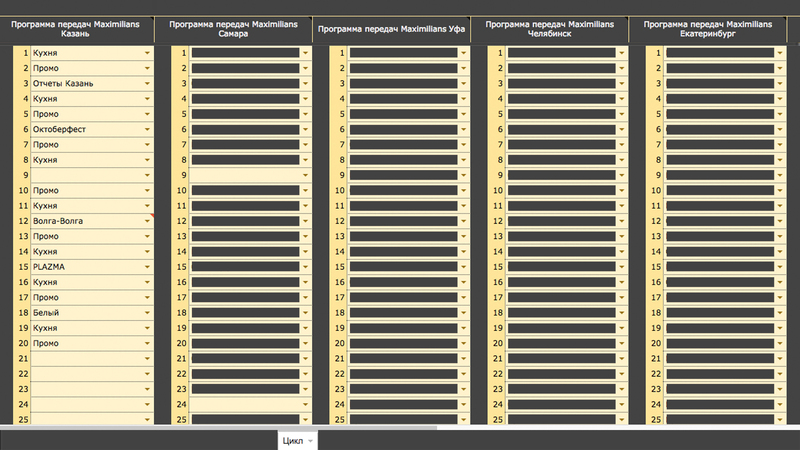 completely exclude the "human factor"
The first thing we started with was the preparation of the program schedule and the test in the first restaurant in Kazan city. Each restaurant stored 50-60 GB of various video: reports of concerts, promo videos of upcoming events, advertising of partners. We took the videos, converted them into the .mp4 format (we convert all videos into one format), optimized the bitrate. The output was 20 GB of videos, which were uploaded to the control unit for the test. What happens if, for example, you showed a television channel from NTV + and decided to switch it to your branded TV channel? Or to the camera above the stage? You just press the button and switch. But in fact there is switching from one HDMI signal to another in on-line mode. This is called as hot switching. In such a case, the sound is interrupted and the picture often skips. If you switch often, it becomes annoying. We've been puzzled over the solution of this problem for a long time, but eventually we put HDMI splitters with EDID signal emulation. Now, when you switch, the equipment determines that it is always on. And even upon switching, guests in the hall do not notice anything. After the technical connection, we began to develop a user profile. In such way, as we have already discussed. First of all, we repeated the arrangement of the media player folders. 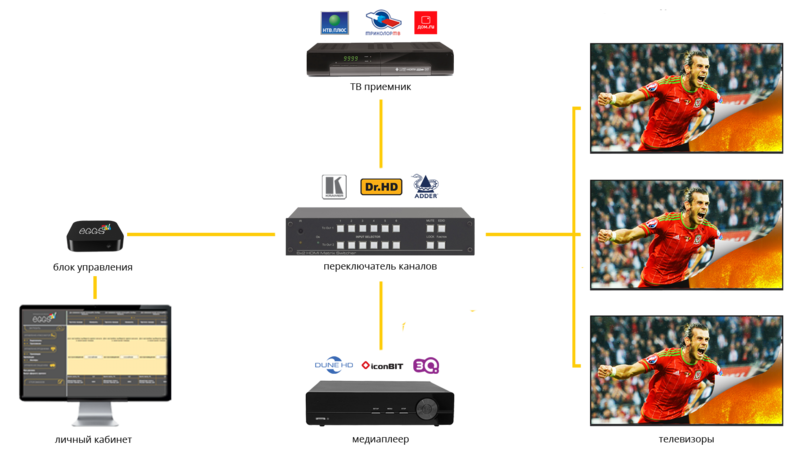 We divided the content of branded TV into Announcements (videos of upcoming concerts), Sales (internal promo videos), Partners (partner advertising videos), Atmosphere (our video channels) and Cycle (sequence setup). For each city, we created separate program schedule (for example, as on Channel One - at the same time in Moscow they do not show the same thing as, for example, in Vladivostok). In total there were more than 700! files only in the Announcements section. To be honest, it's hard for me to imagine how it could be managed using media players. All files in the user profile are named in such way that it would be convenient to work with them. The old analog network was laid in three of eight cities Going back, we tested in a restaurant where was an HDMI network. Of course, for the sake of our system, no one will hollow the walls, re-laying the cable. Therefore, we used HDMI-RCA converters (they are included in the standard Eggs TV set). The signal is worse by 3 times compared to FULL HD, but for places with old wiring - this is a free solution. In the cities where we had technical specialists, we appointed on-site visits. In the cities where we had no customers, we went ourselves. It was the end of 2015 and probably the most exciting journey. When media players were used, subtitles with the name of performing artist, the exact date of performance and the details were added to each video. And these videos had to be remade every time: depending on the city or time of performance. In our situation, we decided to go further - to add subtitles programmably, without remaking of every video. This can be done by triggers. 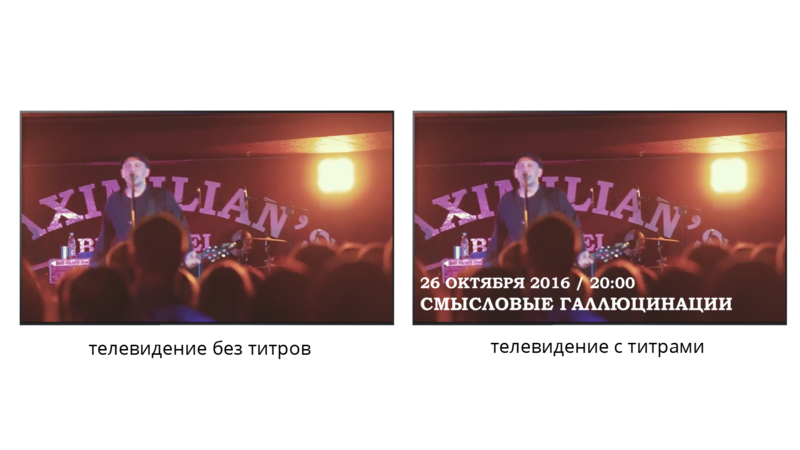 Now the concert video, for example, the Yolka concert in all cities is the same. But for each separate city it has own unique inscription. When a new video is shown, the inscription changes. This is a fine-tuning and it is done only by the content manager. 3. Our customers have stopped constantly remake the videos, in order to add а new information. Now this is done automatically. Each TV channel should have had its own logo. We made a rotating 3D logo in the upper right corner. In order to make the management of concerts more convenient, we have created a separate schedule connected to the user profile. 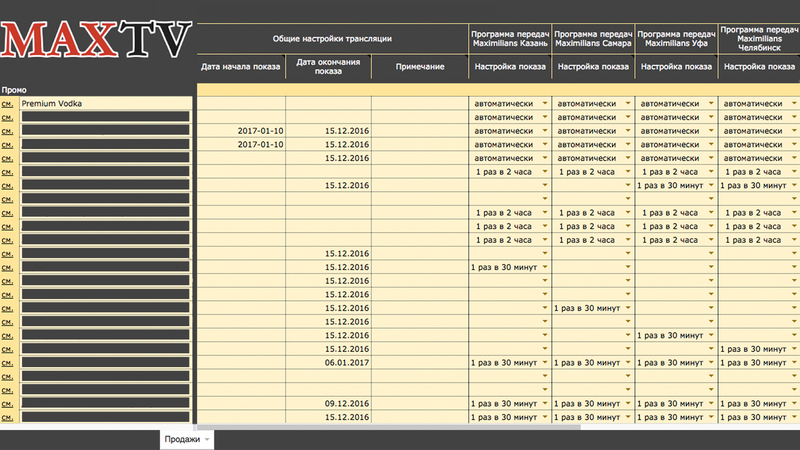 The concerts uploaded to the user profile are displayed in the schedule of the concerts. In addition, we have connected social networks so that the guests in different cities could convey greetings and communicate via screens. But I will mention this in another article.